What is Spiritual? : The "New" Scientology? L. Ron Hubbard created Scientology along with some interesting mythology and equipment. He created Scientology in 1952 as a successor of his earlier self-help system, Dianetics. His early influences included Freud, Aleister Crowley, Hinduism, Buddhism, Carl Jung, Tao Te Ching, the Dharma, and the Vedas. His writings also show Gnostic Christian influences as well. It has come out that Scientology has some rather interesting belief systems that for many years only the higher level followers knew about. This included some rather creative mythology. 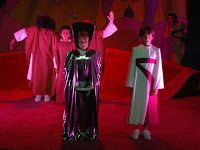 This mythology includes some rather creative science fiction that is sometimes recreated in a pseudo "Christmas" pageant. There are bad guys, good guys, heroes, victims, and saviors. It has all the ingredients for a modern day myth. According to Hubbard, there are extraterrestrial dictatorships such as Helatrobus that used "implants" to brainwash and control the human population. L. Ron Hubbard's lectures and writings include accounts of complex extraterrestrial civilizations and alien interventions in human history. One finds it difficult to believe that anyone could actually believe this to be true. And yet we can observe a deep commitment of energy, money, and time to these beliefs by a reported 50 thousand or more people. 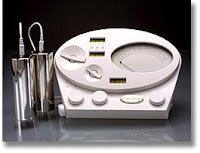 One of the "scientific" aspects to Scientology is its use of "scientific" instruments. This includes a device which is a skin galvanometer called an E-meter (electropsychometer). It is said to allow an auditor (therapist) to observe the creation or destruction of "mental mass'' by reading the needle movement. 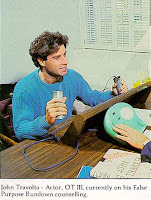 Supposedly this harmful mass is released through a particular therapeutic process unique to Scientology and this release can be measured by the electropsychometer. One wonders what causes intelligent people to get caught up in ideologies so deeply that they can't see the contradictions that present themselves in any ideology. In the video below you will see how Tom Cruise is used to promote Scientology within the inner circle. This video was not meant to be seen outside the church. You can read in more detail about their beliefs here. It is obvious that Tom Cruise is passionate about living a life of meaning and sees Scientology as the answer for all the world's problems. If one believed that they had THE answer I could see how this would produce a particular high. A truly Suppressive Person or group has no rights of any kind as Scientologists and actions taken against them are not punishable under Scientology Ethics Codes. — L. Ron Hubbard, HCOPL of 23 December 1965, "Ethics, Suppressive Acts, Suppression of Scientology and Scientologists"
SP Order. Fair game. May be deprived of property or injured by any means by any Scientologist without any discipline of the Scientologist. May be tricked, sued or lied to or destroyed. 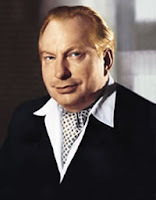 — L. Ron Hubbard, HCOPL of 18 October 1967, "PENALTIES FOR LOWER CONDITIONS"
Suppressive acts are clearly those covert or overt acts knowingly calculated to reduce or destroy the influence or activities of Scientology or prevent case gains or continued Scientology success and activity on the part of a Scientologist. As persons or groups that would do such a thing act out of self-interest only to the detriment of others, they cannot be granted the rights ordinarily accorded rational beings." — L. Ron Hubbard, HCOPL of 5 April 1965, "HANDLING THE SUPPRESSIVE PERSON"
Looking at the development of Scientology one can get a window into how many religious organizations developed over time. Any group that develops a doctrine of outsiders eventually, when given enough power, takes the belief that the outsider is no longer subject to human rights and uses it to treat these outsiders in any manner they want. This result was seen in certain forms of Christianity and Islam, the Third Reich, Stalinists, and others throughout history. This has got me to thinking about what types of things would we consider to be deal killers when looking at various belief systems available. What teachings would simply negate anything else the belief system or organization had to offer? Any teaching system that uses fear or violence to justify its belief or to convince people of its being true. Any teaching system that appeals to the ego to convince people of its being true. Any teaching that abandons self examination and accountability. Any teaching system that is unwilling to grow and change. Any teaching that creates criteria for judging the relative worth of conscious beings. "One wonders what causes intelligent people to get caught up in ideologies so deeply that they can't see the contradictions that present themselves in any ideology." What you and Bill Maher can't seem to grasp is that intelligence has nothing to do with religion. Religious beliefs don't have to "make sense" or be logical. By their very nature, they aren't even supposed to, otherwise they'd be science or something else, not religion. Scientology, Christianity, Islam, etc. don't have to make sense. They don't have to be free of contradictions. That's religion. Just accept them for what they are and move on. anonymous posted "What you and Bill Maher can't seem to grasp is that intelligence has nothing to do with religion." That seems to be obvious. Anonymous posted "Religious beliefs don't have to "make sense" or be logical. By their very nature, they aren't even supposed to, otherwise they'd be science or something else, not religion." And yet, somehow, a religion called Scientology has nothing to do with science. Anonymous posted "Why did you start out with a pretense of open-mindedness and fairness, and then quickly take a sharp right turn into attacking Scientology beliefs and ridiculing and insulting those who choose it as their religion? There was no call for condescention like this:"
Open mindedness doesn't mean accepting everything as true. It means taking the effort and time to look at something as if it was true. I can understand how Scientology could provide a framework of change for someone. Most religions have some part of their system that is true and provides insights and growth. Unfortunately this "part" seems to give many of them the right to claim that all of their beliefs are true and helpful. What I have observed is that any organization that is not open to critical analysis will have a built in blindness and will continue to hold on to false and sometimes harmful beliefs, no matter how much nonsense they are based on. There are many things in life that I am willing to accept for what they are. A wonderful piece of music doesn't have to make sense. An experimental expression of art doesn't have to make sense. And even a religious belief that expresses the inner most longings of the human soul doesn't have to make sense. Religion begins to have problems when a particular religion takes these private experiences and either claims that everyone needs to have these or they force everyone to accept them. It is at these points that religion ceases to be harmless. At these points religious claims should be accountable to intelligent evaluation.